Among the Fallen from Rutland are three women. Two were members of the Women’s Royal Air Force and one was a nurse. All three are buried in local churchyards and all three have their graves maintained by the Commonwealth War Graves Commission. Sister Helen Hetterley from Penn Street in Oakham became a hospital nurse in 1912 and when the war started she was stationed at the Military Hospital in Canterbury. She caught TB while treating injured soldiers and nothing could be done to treat her and she died at home in May 1917. She’s buried in Oakham Cemetery. Unusually her grave has both a private memorial and a CWGC headstone. Gladys Walter was a Member of the WRAF – which is the equivalent of an Aircraft Mechanic or Private in the (men’s) RAF. 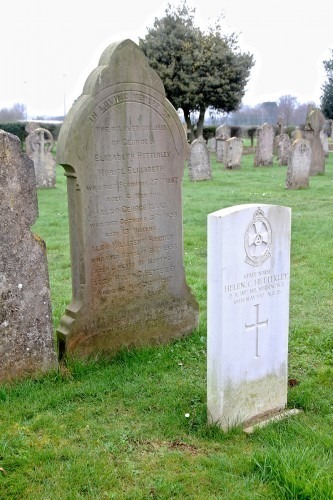 She died on Armistace Day – 11th November 1918, and is buried in the churchyard in Braunston. She has a CWGC headstone but is not recognised on the war memorial inside the church. And in Ryhall churchyard there is the grave of Lilian Plant who was also a member of the WRAF. Little is known about her and her service record, but she died after the war in early December 1918 aged 26. She is buried close to three servicemen also from Ryhall, in a row at the front of the second section of the churchyard.